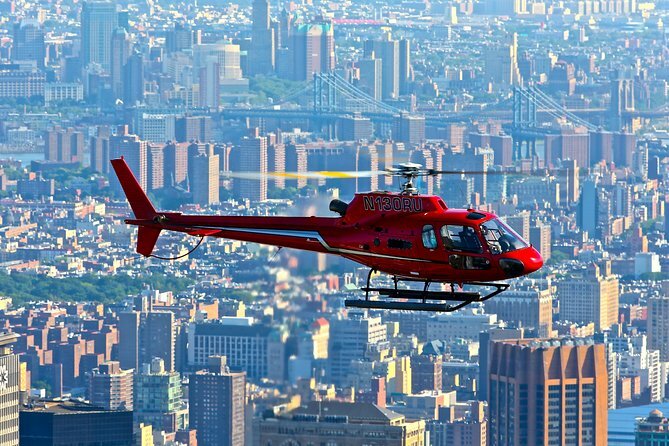 See New York's famous landmarks from the air on an exhilarating 15-minute helicopter tour. You'll come face-to-face with the Statue of Liberty as you fly above the Hudson River. Admire the iconic Empire State Building, the silver Art Deco brilliance of the Chrysler Building, and the sprawling green expanse of Central Park. A must for any visitor to New York City! On your 15-minute New York sightseeing helicopter flight you'll experience the grandeur of Manhattan's famous skyline in a way that's impossible from the ground. You'll also see the most famous landmark in the US, the Statue of Liberty, from the air! Starting from New York's Downtown Heliport, situated close to Battery Park and Wall Street, your flight takes you past the World Financial Center, Empire State, Chrysler, Woolworth, and Met Life Buildings and over Ellis Island and the Hudson River to reach the George Washington Bridge. Your pilot is on hand to provide commentary on the points of interest seen during your flight via the headphones provided, and all seats on board the helicopter provide spectacular views over the city. Escape New York's lines and crowds by taking to the skies! Please note: The listed price does not include the heliport fee, USD$40.00 per person, payable at the time of tour check-in.